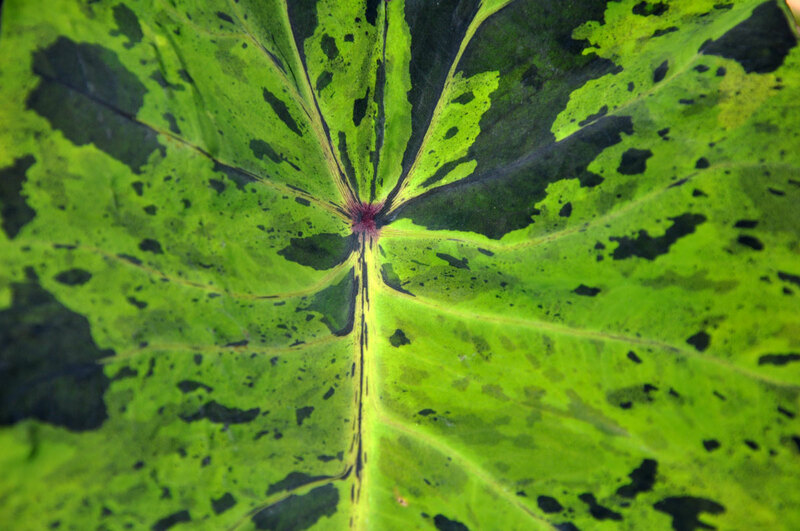 Alocasia Odora is an ornamental plant with big leaves and provides an instant "tropical look" to the yard. 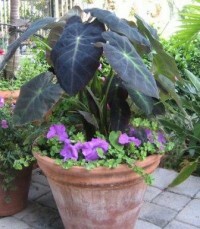 Striking foliage with large, deep green upright leaves provides for a dramatic effect in a container or the garden. Odora can withstand very low temperatures, down to about 0°F (zone 7a). In colder climates you can “chop the top” and bring it indoors for the following spring. Alocasia Odora has big upright leaves that can be more than 3 ft (1 m) long. This is a gorgeous and easy to grow elephant ear! 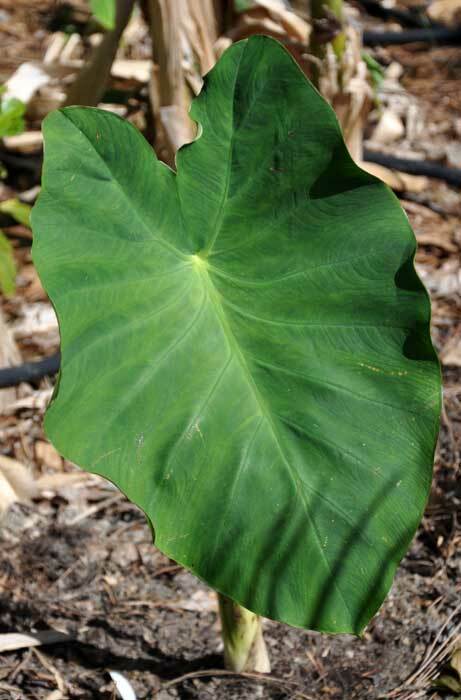 Colocasia Ele Paio or 'Milky Way' is a spectacular rare elephant ear that originally was available only to Hawaiian Royalty. The 3’ tall leaves are heavily spotted with paint-like white flecks; some leave are even entirely white on one side. The markings are random and no two leaves are quite the same. 'Milky Way' is a dramatic landscape plant for a bright spot in the garden that doesn’t receive direct sunlight. Direct sun can burn the white parts of the leaves. This plant thrives in rich, organic, moist soil. It is a fast growing plant. Rising to about 36 inches, Colocasia "Black Beauty's" dark black leaves make it a very impressive centerpiece in a mixed container. Patios, landscapes, containers & ponds all around the world are just waiting to have this specimen. Portora is truly a spectacular upright elephant ear. 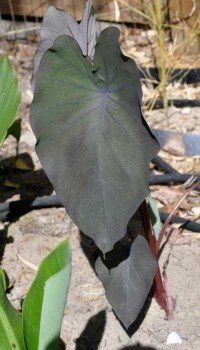 It is a large, stunning specimen with broad, wavy, scalloped leaves and purple stalks that will grow up to 10 feet tall. You can grow this plant in full to part sun. This is truly an architectural specimen plant for any garden. 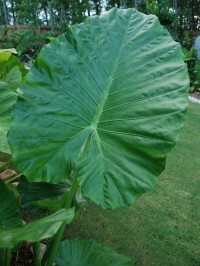 The enormous elongated heart-shaped leaves of Elephant's Ears make them useful accents in beddings (where space permits), large containers and water gardens. Seldom-seen flowers resemble trumpet-like Callas. Also known as Taro, its tuberous roots are eaten as food in many tropical areas. Heat- and water-loving, it can be grown outdoors year-round in frost-free climates. Elsewhere, lift and store tubers in the fall. Best in climates with hot and humid summers. Divide in spring. 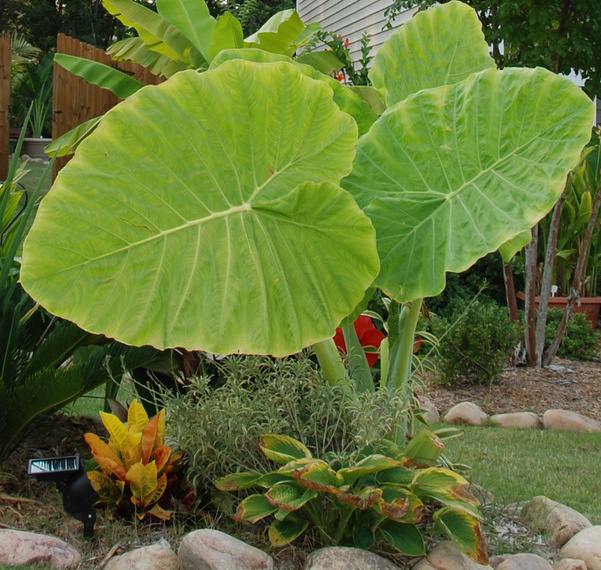 An incredible Elephant Ear that reaches enormous sizes. Colocasia Jacks Giant is believed to be a tetriploid form of a common Colocasia esculenta which means a much larger grower with huge thick leaves. It also produces runners and is much more vigorous than most forms. 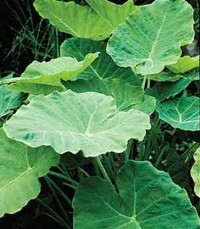 The huge-leaved taro is a striking feature in the landscape, but not for the timid or refined garden. Taro makes a bold statement next to a water garden or along a small stream. It can also be grown in the vegetable garden if supplied with plenty of water. 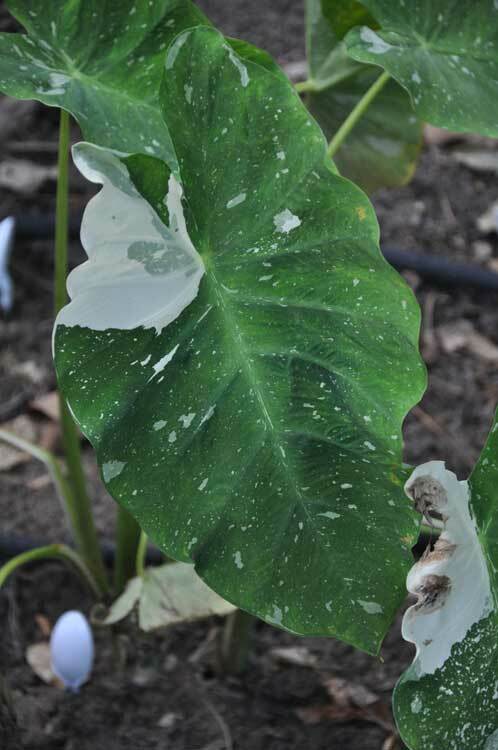 Even though it seldom produces viable seeds, taro will spread and if not contained it can become a serious pest weed in wetlands. There are more than 200 cultivars of taro, selected for their edible corms or cormels, or their tropical looking ornamental foliage. These fall into two main groups: Wetland taros, the source of the Polynesian food poi, and upland taros, called "dasheens," which produce numerous eddos that are used much like potatoes, as well as a large edible mammy. Most of what you see in the garden are the later (as seen in the photos). If you're looking to add another wildly variegated ear to your garden, one that'll turn heads, this is it. Colocasia 'Mojito' (pronounced Mo-he-toe) is named after the popular Cuban mixed drink. The stunning leaves are medium green with dark purple flecks throughout. In moist, rich soils, the clump should reach around 3ft, less in drier locations. 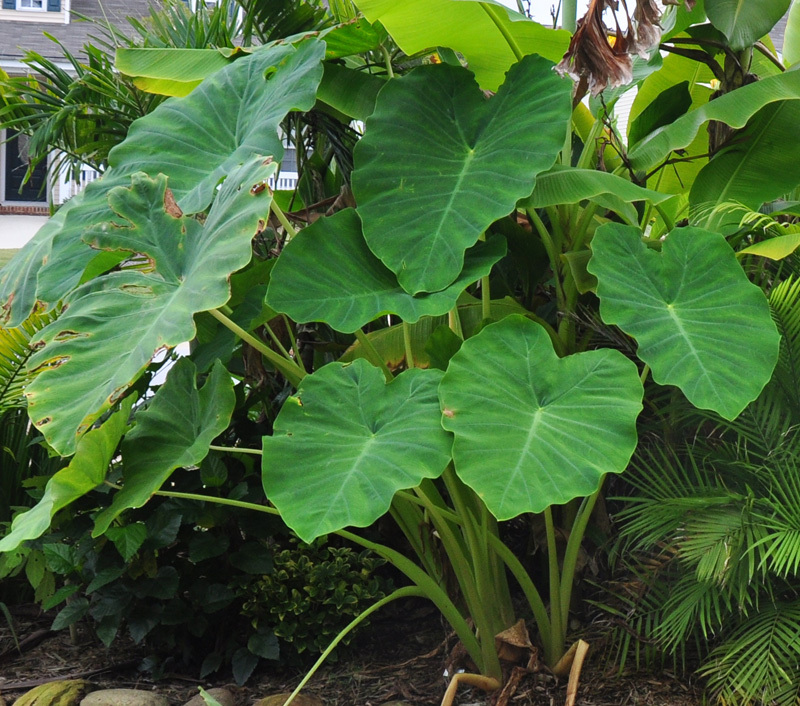 Colocasia Gigantea is a beautiful elephant ear that can reach enormous sizes if given the right conditions. It loves water, so be sure to give it plenty. You can even grow it in standing water (pot or not).